Why Proton Therapy? »	What is Proton Therapy? When doses of protons enter the body, they deposit most of their energy at a specific target, destroying cancerous cells and reducing damage to surrounding areas and critical organs. This differs from conventional radiation, which uses x-rays that have a higher entrance and exit dose both before and after the tumor. To further explain, take a look at the graph below, and imagine that the Y-axis (radiation dose) is the surface of a patient’s skin, and the area between the dotted line is a tumor. The goal of treatment is to deliver the proper dose of radiation directly to the tumor while limiting the amount of exposure to surrounding healthy tissue. The sloping gray area shows how x-rays deliver a dose. To deposit the proper amount of energy into the tumor, conventional x-rays must irradiate much of the healthy tissue in front of it, and by their nature they continue to penetrate through the tumor and irradiate. Both conventional (x-ray) radiation therapy and proton therapy attack tumors by preventing cancer cells from dividing and growing. Conventional radiation therapy uses x-rays which enter and exit the body, potentially causing damage to the healthy tissue that surrounds the tumor being treated. 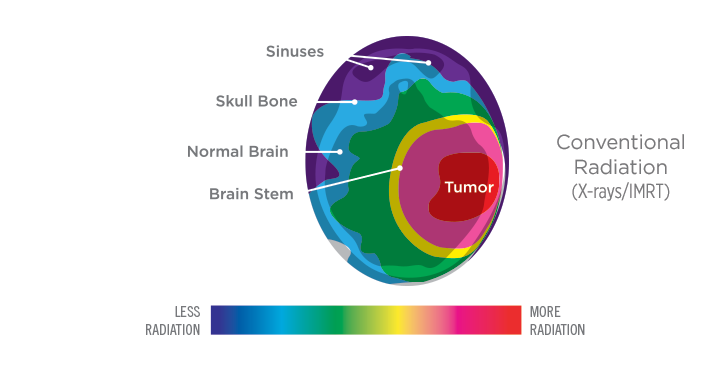 Proton therapy targets the tumor with precise accuracy, allowing patients to receive higher, more effective doses, and reducing damage to nearby healthy tissue. Provision CARES Proton Therapy features Pencil Beam Scanning (PBS), which increases the accuracy and advantages of proton therapy. 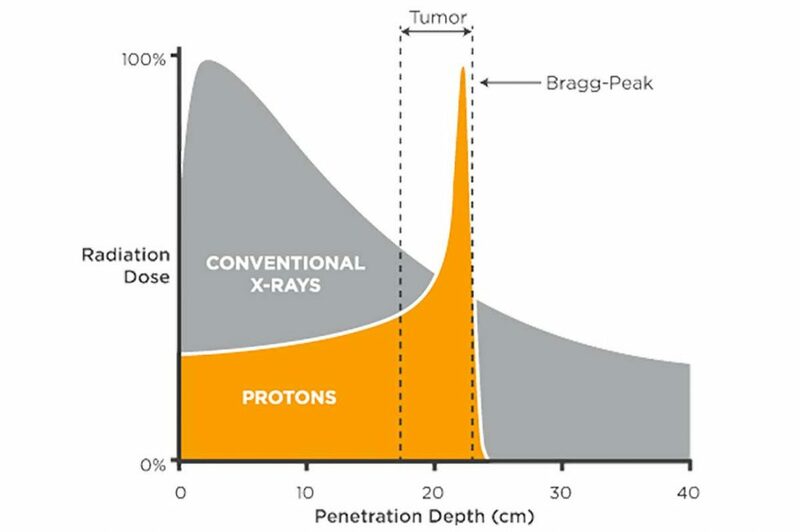 With PBS, oncologists can treat a tumor using the proton beam at a precisely configured range and adjust the intensity of the beam to achieve the appropriate dose, then stop the beam in its tracks, limiting the collateral damage. As a result, vital organs surrounding the cancer are better protected from unnecessary radiation, thus minimizing or completely avoiding treatment-induced side effects, such as nerve damage with resulting neurologic dysfunction, as well as avoiding other complications such as breathing difficulties, feeding tubes, nausea, impotence, secondary cancers and more. 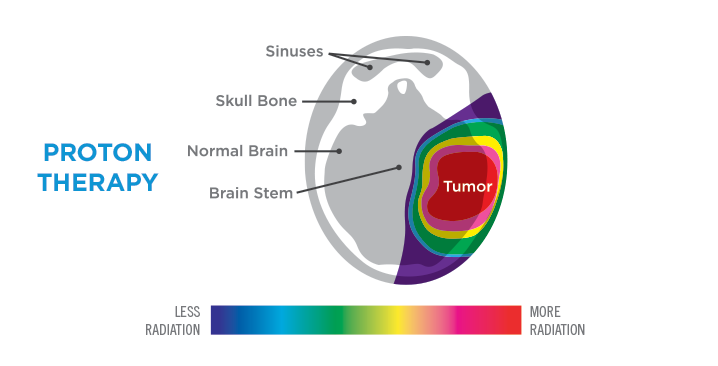 A non-invasive treatment, proton therapy for cancer is best used to treat individuals with a localized tumor where cancer has not spread to other parts of the body, or when tumors cannot be removed surgically, or in some cases when radiation therapy is required in addition to surgery. Proton therapy may be combined with other treatment options, depending on the specific details of your case. PBS also allows for a number of additional tumor sites to become candidates for proton therapy, including tumors of the lung, liver, breast, esophagus, pelvis, large sarcomas, high-risk prostate, and mediastinal tumors as well as re-irradiation of recurrent tumors, expanding the percentage of cancers that were considered good candidates for proton therapy from 20-30 percent to 80 percent. Large and non-contiguous targets benefit especially from PBS proton therapy. PBS also allows clinicians to sculpt doses to the complex shape of an individual tumor, which is ideal when treating tumors next to critical structures.